I really don't need texts like that to color my day. If I had the courage right now, I would tell you to stop texting me and yet I hold on, hoping that maybe one day you might want me back. But I don't even know if that's what I want. Do I want to live in the gray area that we've been in for the last couple of years? No! I want to feel my blood coursing through my veins, hot and flaming and never fall into a funk where I forgot the woman I am. 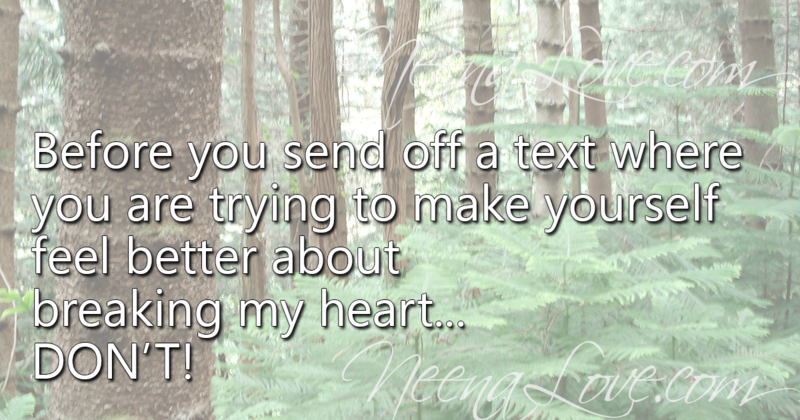 So, before you send off a text where you are trying to make yourself feel better about breaking my heart - DON'T! I don't need to hear it. I don't need to rehash anything. I have made peace with your leaving and I never want to rehash any of these feelings of heartache again. Not from you. Not from anyone who has ever broken my heart. You don't get to do a do-over with me. The way you treated me when you told me you wanted a divorce and the immediate days after our break up was probably the worst thing I have ever experienced (aside from the loss of my mother). The way you made it seem like I was the enemy still makes my stomach turn when I think about it. I know that I am a damn good woman and a damn good wife. You treated me like I was some skank off the street trying to trap you, like I did something wrong to you. When I cried throughout this process, you looked at me with such disgust that even now I am amazed that you ever loved me. So, don't text me with your guilty conscience texts. I don't want to hear your regret or your mantra trying to convince yourself that divorcing me is the best thing for both of us. Since we did it, we might as well keep moving ahead. Trust me when I say that you will NEVER have the opportunity to be with me again. EVER. And it's not because I don't love you because Lord knows I do. It's because of how you treated me in those final days. Call me bitter. Call me whatever you want. Just know that I am so done with you! Always loved this song. But I never heard it the way it was supposed to be heard until you placed it at the end of this post. Powerful! Now I'm in my emotions about the same issue from decades ago. Whew!